Could Snapchat Be the Next Myspace? 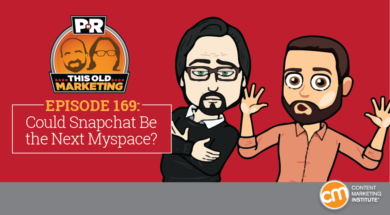 This Week in Content Marketing: Could Snapchat Be the Next Myspace? In this episode, Robert and I discuss how P&G is rewriting the rules for agencies and media placement. We also examine why a slew of publishers are recreating the media business model, and debate whether Snapchat’s performance decline is an indication that a Myspace-level fail may be in its future. Our rants and raves cover the value of sensibility and a likely strategy for acquiring Twitter; then a listener gets charged up about an example of the week from General Electric. P&G lays down new rules for agencies and ad tech to get paid (09:34): Procter & Gamble Co., the world’s biggest advertiser, has outlined a five-point program aimed at increasing transparency and billing accountability in the media service supply chain. To enforce the new standards, P&G’s Chief Brand Officer Marc Pritchard says the company will no longer pay digital media businesses, ad tech companies, agencies, or other suppliers for services that fail to stay in compliance, according to AdAge. While I admire P&G for trying to emphasize behaviors over views when it comes to contract terms, Robert and I feel there must be a better way to drive this change than bringing in a third-party accreditation group as a watchdog. Is Instagram Stories snapping up Snapchat’s share of the market? (21:31): TechCrunch reports that analytics providers, social media celebrities, and talent managers have observed a noticeable decline in Snapchat Stories usage since Instagram launched a virtually identical service in August of 2016. Meanwhile, Instagram Stories is experiencing rapidly growing view counts and “insanely high” engagement to follower rates. I see three options here: Snapchat should either pull back on its plans for an IPO and beg Facebook to acquire it, find a new point of differentiation, or just change its name to Myspace and call it a day. Media firms must diversify to survive (29:11): Support is gathering around one of my favorite topics of discussion: This week, The Guardian published an article that predicts the eventual demise of the traditional media model and recognizes that falling ad revenues are spurring media companies to find new opportunities in areas such as e-commerce and events. The examples cited in the Guardian piece have inspired me to add a bold statement to my previous predictions on the subject: Years from now, the revenue models used by publishers will be indistinguishable from those currently adopted by brands. The Today Show is building tomorrow’s audience through email (34:00): While we were recording this episode, a message came to us from CMI’s PR manager Amanda, and we wanted to pass it along as an encouraging sign of what may be to come. It’s common for broadcast media to reach out to publicists about stories that will be airing on TV. However, the email Amanda received from NBC’s The Today Show this time around wasn’t promoting the TV show; instead, it asked her to subscribe to the show’s email newsletter. This emphasizes just how important email subscriptions are ­– not just for the publishers, but also for any brand that wants to build an audience through content marketing. Pressly: The Starter’s Guide to Sales Enablement: It’s no secret that sales and marketing departments have a complex relationship. Each has entirely different objectives, workflows, and methods of measuring performance. But these departments also share the same essential need: Both require the right content, at the right time, in order to do their jobs. Pressly’s “Starter’s Guide to Sales Enablement” dives into how you can align sales and marketing and start building conversion-focused content today. Download it now! Joe’s rave No. 1: I caught a recent interview with New York Times CEO Mark Thompson, in which he said that the Times is planning to increase its investment in content promotion in 2017. This was music to my ears, as many companies fail to put enough marketing support behind their content to maximize its potential for success. Joe’s rave No. 2: At long last, I’ve finally finished reading Tim Ferriss’ Tools of Titans. One of the book’s themes that has stuck with me is the notion that acting sensibly – while often perceived favorably – may actually hold us back from reaching our goals. Many of today’s most successful people achieved their position as a result of not being sensible and not following the rules that others had established. I encourage our listeners to go back to your own content plans and look at whether there’s something you can deliver to your customers that is different, unexpected and, perhaps, not entirely sensible. Robert’s rave No. 1: Coincidentally, Robert also spent this week trying to make some sense of sensibility. As digital marketers, we often err on the side of what he calls “small marketing.” Unfortunately, he explains, the tendency to play it safe by pursuing small, incremental goals means we will never make progress on addressing the big strategy problems we are facing. Robert’s rave No. 2: Robert also came across a Recode article, which looks at how Google has slowly been acquiring bits and pieces of Twitter’s developer products. While Robert’s predictions for 2017 include the possibility of Google purchasing Twitter outright, he feels the piece-by-piece scenario described here may be a bit more realistic. The GE podcast theater production The Message, and its successor, lif-e.af/ter, are absolutely fantastic examples of content marketing. I, for one, had no idea of GE’s role in the production and didn’t think much of the ‘brought to you by Panoply and GE Podcast Theater’ strapline in the opening, beyond it being the usual sponsorship message. Turns out, the story is closely linked with GE’s recent work in sonic therapy. Asuthosh also points out that GE’s efforts totally resonate with This Old Marketing’s recurrent theme of brands as publishers. Robert and I couldn’t have said it better ourselves.